white color or skin color. It consists of microporous perforated Polyethylene film and medical hypo-allergenic adhesive,it can be used in Orthopedic surgery and face surgical operation with making dressing inconspicuous,and fixing lines and dressing. 1. Transparence allows monitoring the insertion site without the need to remove the plaster. 2. Permeability make the skin breathe naturally,and excrete water,air and sweat,and also reduce the chance of infection. 3. Hypoallergenic and proper viscidity for reliable fixation,not to irritate and hurt the skin when remove the plaster. 4. Tear in double-direction can easy to rip,easy to apply,enhances the working efficiency. 1. Keep the skin clean,sterile and dry before using the plaster. 2. 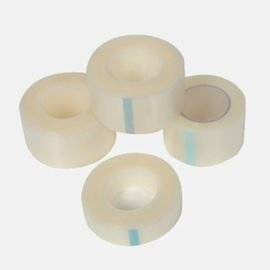 For secure and reliable fixation of dressing,one side of tape over entire dressing must more than 2.5CM to stick the skin. 3. After sticking,press back and forth to give the most effect of adhesive. 1. Fixation of infusion needle and infusion lines. 2. Used for wrapping the wound,fixing the dressing. 3. Used for fixing the Hemodialysis tube. 1. Forbid strictly directly stick to the wound on the skin. 2. The skin allergy please obey the doctor’s advice.